TR 53307 Universal calliper providing simultaneous reading of diameter and circumference. Range 25-95 mm. 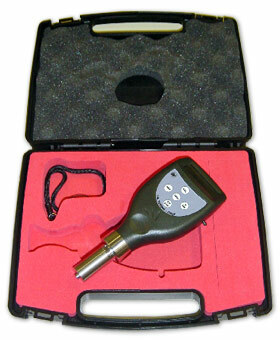 The Shore hardness tester is used for the hardness determination of fruit and vegetables. 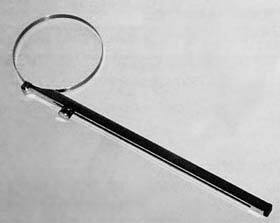 Hardness tests can be done in either a vertical or horizontal position and on places which are difficult to reach. 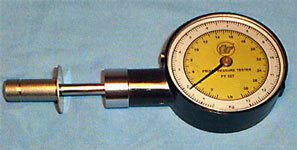 Measurements can be carried out on the products where the classic fruit pressure tester (a destructive instrument) do not give acceptable results. The instrument is very simple to use: once taken the instrument, place the plunger against the fruit and progressively press until the fruit is completely against the grey basement of the plunger. For a more meaningful control it is necessary to take various samples of fruit. Two measurements must be carried out on each piece of fruit - on the opposite side of the fruit. The determined value, average of the two measurements, is expressed in Shore degrees, range of reference for the hardness of a material.